Place poblano chiles on a foil-lined baking sheet, and broil for 8 minutes or until blackened, turning after 6 minutes. Place in a zip-top plastic bag; seal. Let stand 15 minutes. Peel chiles, and discard the seeds and membranes. Finely chop. Combine milk and bread in a large bowl; mash bread mixture with a fork until smooth. Add poblano chile, 1 1/2 tablespoons cilantro, cumin, coriander, paprika, 1/4 teaspoon salt, 1/4 teaspoon black pepper, and beef to milk mixture, tossing gently to combine. Divide mixture into 4 equal portions, gently shaping each into a 1/2-inch-thick patty. Press a nickel-sized indentation in the center of each patty. Cover and chill until ready to grill. Combine the remaining 1 1/2 tablespoons cilantro, remaining 1/4 teaspoon salt, and remaining 1/4 teaspoon black pepper in a medium bowl. Stir in sour cream, shallots, and juice. Remove 1 chipotle pepper and 2 teaspoons adobo sauce from can; reserve remaining chipotle peppers and adobo sauce for another use. Chop chile. Stir chopped chipotle and 2 teaspoons adobo sauce into sour cream mixture. Set aside. Place patties on a grill rack coated with cooking spray; grill 3 minutes or until grill marks appear. Carefully turn patties; grill an additional 3 minutes or until desired degree of doneness. 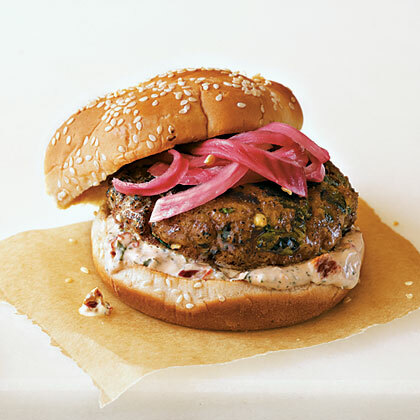 Place 1 patty on bottom half of each bun; top each serving with 3 tablespoons chipotle cream and 1 tablespoon Pickled Red Onions.